This Baked Honey Garlic Chicken is an easy meal that’s ready in just 30 minutes. Tender chunks of chicken are coated in a zesty seasoning, baked until golden, and then tossed with a honey garlic sauce. Perfect for busy weeknights, this chicken will be the hit of your dinner table! I mentioned before that I don’t totally love chicken, but it seems that I keep shoving chicken recipes in your face. Maybe I should rephrase that a bit…I do like chicken, but I really need to jazz it up with flavor in order for me to love it. I usually never order chicken at a restaurant, unless I’m in the mood for chicken marsala, or it comes in a pasta dish or pizza. Because, you know, I can’t resist carbs. But since the hubster loves chicken, I like to challenge myself to create a dish that we’ll both enjoy. This Garlic Bruschetta Chicken definitely hit the spot, and so did that Chicken Fettuccine Alfredo. So, moral of the story is that I need chicken with lots of flavor in order for me to love it. And since it’s 30 minute Thursday, I have my latest (and greatest) chicken recipe for you. It’s a simple dish that can be prepped, baked and ready to be devoured in a half hour. How about that for a Thursday? This chicken is anything but boring! I love baking with honey, but when I can combine it in a savory recipe and add in some garlic, I’m a happy girl. Because, remember, garlic and I are best friends. And it just so happens that honey and garlic get along pretty well, too. Another ingredient that makes this Baked Honey Garlic Chicken so special is the Italian breadcrumbs. It contains just the right amount of flavor to coat the chicken. And when the chicken bakes, it turns crispy and golden brown. Perfection right there! And now, onto my favorite part of this chicken, the honey garlic sauce! And it really couldn’t get any easier. The flavorful mixture combines honey, olive oil, garlic powder, salt and pepper. That’s it! Once the chicken is baked, simply toss it with the warmed sauce and get ready to be amazed. Your taste buds will thank you, trust me! This Baked Honey Garlic Chicken is crispy, flavorful and packed with just the right amount of seasoning. 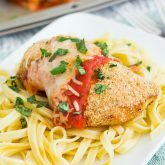 It’s also the perfect weeknight meal and pleases even the pickiest of chicken eaters! 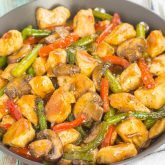 Serve this chicken with some white rice, potatoes, or vegetables, and you have a deliciously easy 30 minute meal! Looking for more chicken dishes? I’ve got you covered! This Baked Honey Garlic Chicken is an easy meal that's ready in just 30 minutes. 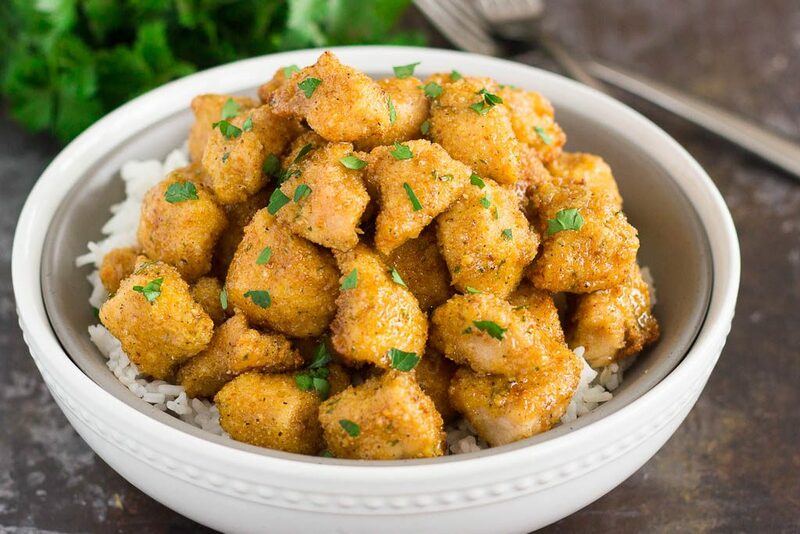 Tender chunks of chicken are coated in a zesty seasoning, baked until golden, and then tossed with a honey garlic sauce. Perfect for busy weeknights, this chicken will be the hit of your dinner table! Preheat oven to 400F. Line a large baking pan with parchment paper or coat with non-stick cooking spray. Set aside. Pour breadcrumbs onto a plate or shallow baking dish. Season with salt and pepper, stir to combine. Add beaten eggs to a medium bowl. Working in batches, add chicken pieces to egg mixture, making sure each piece is fully coated. Then, dredge chicken pieces in bread crumb mixture, coating all sides. Place onto prepared baking pan. Repeat with remaining chicken pieces. Bake for 20-22 minutes, or until chicken is cooked through and golden. While chicken is cooking, prepare sauce. In a medium bowl, combine the honey, olive oil, garlic powder, salt and pepper. Microwave for about 20 seconds until slightly warmed. Stir to combine. When chicken is cooked, add to honey mixture and toss to coat. I'm all about breadcrumbs on chicken. And that honey sauce! Oh my. I'm definitely giving this one a shot! Gayle, this baked honey garlic chicken looks insane! I can't believe that's baked! looks soooo good!! Thank you, Alice! This chicken is one of my favorites, I've made it several times now! I feel the same way about chicken!! It needs to be jazzed up for me to enjoy it!! Loving the honey garlic flavor! I feel like this would be a chicken dish I would enjoy!! Happy Thursday!! Thank you, Ashley! Jazzed up chicken is the best! :) Happy Thursday to you, too! Well thanks, Demeter! Chicken needs to have lots of flavor for me! :) I am not experienced with tofu at all, but that does sound like good idea! Hope you have a great weekend! I love easy recipes like this, sounds yum! Love how easy to make this is! Looks delicious and the sauce is perfect! Pinned! Chicken does need a lot of love to be good, and this chicken looks really good! I love crispy chicken like this, especially when it's on the healthier side. The honey and garlic sound like a delicious way to flavor this up -- yum! Oh my gosh, this sounds delicious and SO kid-friendly! Love your 30-minute dinners! You had me at baked! It's so much healthier that way, right? The honey garlic sounds wonderful. And you can't be the fact that it's a 30 minute meal!! Totally healthier than the fried kind, and so much better! :) Thanks, Jen! I love how simple the sauce is! So often "honey garlic" means a whole whack of other things. 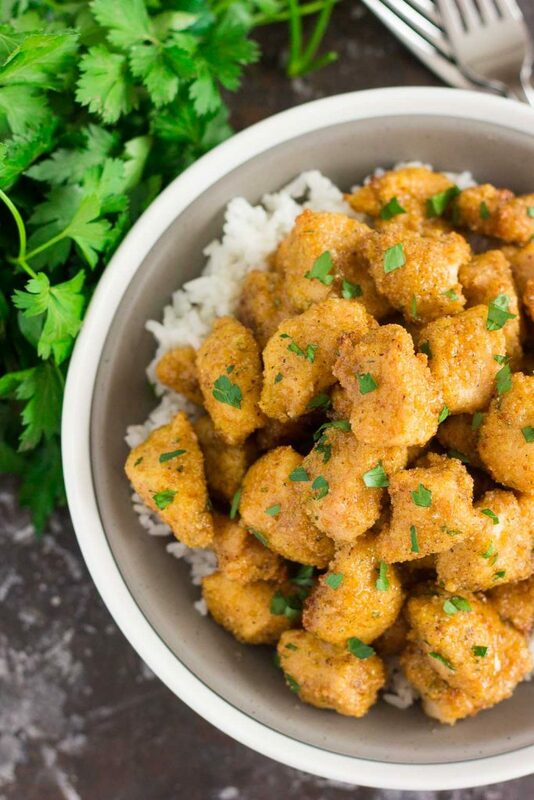 This is sooo right up our alley -- we love honey garlic chicken! Thank you, Denise! I'm so happy with how the design turned out. And thanks for the chicken love, too! Honestly, you can never have too many chicken recipes. I love it. But same with you, I hardly ever order it out at restaurants. But it's definitely a great staple to make at home. Love the savory-sweet flavor combo here! That's true...new chicken recipes are definitely welcome! Thanks for the kind words, Liz! I make breaded chicken cutlets all the time but I never think to cut them into bite sized morsels...I love this! Good call on a tasty chicken dish! Love that you cut the chicken into bite-sized pieces! Looks so good! I never order chicken out either, Gayle, but I do cook it often at home. I LOVE honey garlic chicken, SOOOO good! And yours looks amazing! I love that you cut it into bite sized pieces and this is baked instead of deep fried! Looks absolutely delicious, girlfriend! You are right - this chicken is anything but boring! Pinned! Cheers! I didn't know you weren't a huge fan of chicken. But I do agree that it needs to be jazzed up a lot for it to taste amazing. This chicken looks fantastic Gayle! I can not wait to give it a try. Plus done in 30 minutes. That's a win win in my book! How amazing does this chicken look?? I seriously love the sound of that honey sauce---my family would gobble these up like nobody's business! This looks so easy and so delicious! I'm always looking for new ways to prepare chicken because the old standbys can get boring. I'll have to give this recipe a try! Thanks, Kristine! Hope you like this if you try it. I never order chicken in restaurants either. It just seems to ordinary for dining out. 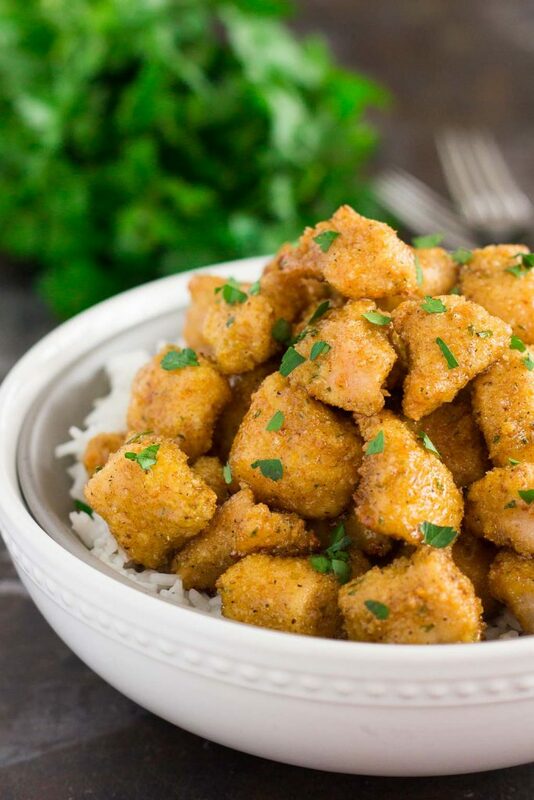 Your garlic honey chicken, however, is anything but ordinary! It looks delicious and you gotta love a 30 minute meal on Thursday or any day of the week! Oh gosh - I could eat that ENTIRE bowl of gorgeous chicken by myself - and the 30 minute part is the icing on the cake! Pinning! Thanks for the kind words and pin, Kate! 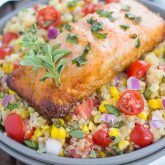 This is the perfect easy weeknight dinner! We make a lot of chicken around here and the honey garlic sauce sounds amazing with the baked chicken! Looks so delicious I love how simple the ingredients are! Cannot believe this is baked! This looks so perfect for an effortless weeknight dinner! Need to give this a try! Thank you, Melissa! It really is so easy to make! YUM! What a delicious-looking chicken recipe. LOVE that it's quick too. You can't beat that. Your blog design is SO cute! Thanks for the kind words, Michele! I make chicken the most out of any other protein for dinner. So keep the chicken recipes coming! I Need as much variety as I can get. I love this baked honey garlic variation. Looks crispy and delicious! I love honey garlic chicken. We make chicken constantly around here, everyone loves it - and I know the kids would go crazy for this honey garlic version! 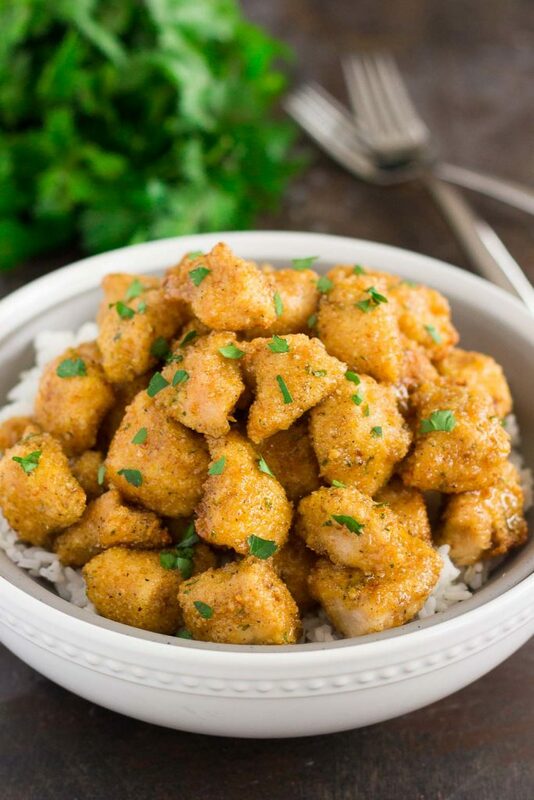 This is an easy dinner idea · Baked Honey Garlic Chicken is one of those recipes that I have tried it and i'll find myself making it over and over. Thank for the kind words and for stopping by, Zubia! This sounds great, but I have to ask - why garlic powder? It is like instant coffee compared to fresh brewed coffee. Why not fresh garlic? It take no extra time and the flavour is so much fresher! Hi Mark! 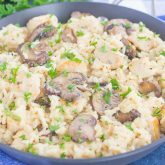 You can certainly use fresh garlic, I just preferred to use garlic powder in this recipe.